Amanda and I decided in November 2004 to visit Texas to take advantage of favourable £/$ exchange rates and, hopefully, grab some winter sun. It is not the kind of trip that needs months and months of planning. 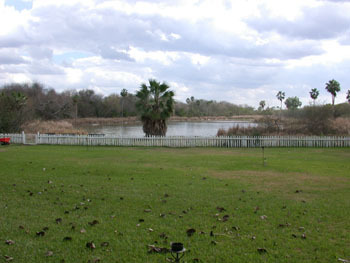 Very few of our hotels were pre-booked although at peak birding times, arranging accommodation in advance, especially around High Island and the Rio Grande Valley west of McAllen, is essential. By all accounts, January is not the optimum time for birding (April migration is the time to go!). However we were not disappointed by both the numbers and quality of birds seen. The Rio Grande Valley in particular was exceptional for Mexican vagrants. By and large the parts of Texas that we saw are flat and boring, with most of the landscape being covered by scrubby vegetation, all of which has spines, spikes or thorns. There are occasional wooded areas where native squirrels are common. I cannot really think of any good reasons why I would visit the area if I wasn't a birdwatcher. We went for the cheapest flights from Manchester, which turned out to be BMI with their US partner United Airlines. Economy was £390 each. With BMI seat pitch of 32 inches the 8hrs 40min flight from Manchester to Chicago was quite comfortable. We managed to get a free upgrade to New Economy with legroom of 38 inches for the onward transfer of 2hrs 40mins to Houston. The outward flights were full with people returning to the USA after the Christmas holiday in Europe. However the return flights at the end of January were only 2/3 full and we managed to get exit seats for the Chicago to Manchester stretch, giving us one of the most comfortable flights we have had for some time. The main drawback with this route in winter is the unpredictability of the weather in Chicago. We arrived in a snowstorm and circled O'Hare airport for over 30 mins before landing at c14.00hrs. Going through Immigration was relatively painless and well organised but our luggage was slow to appear and the departure of our onward flight was fast approaching. We needn't have worried. The flight was cancelled, as were the rest of the day's flights to Houston and we had no alternative but to head to the Crowne Plaza Airport Hotel for the night, with only our hand luggage as our suitcases were booked through to Houston and we were told would be on the first available flight, to meet us when we eventually arrived. The first available flight out the next day was 16.50hrs but with temperatures still sub zero and the knock-on effect of more than 1300 cancelled flights from the previous day we eventually left Chicago at c 19.00hrs. Thankfully our luggage was waiting for us on arrival in Houston and, having picked up the hire car at 22.30hrs, we made a fast exit to the nearest convenient hotel. Car hire was sorted out in the UK prior to departure to avoid all the additional CDW and other ancillary insurance issues. The all inclusive price for a full size 4 door auto with air con was £584.90 arranged with Holiday Autos/National USA. Having checked in at the Car Hire Centre, getting the car was a totally new experience. We were directed to the full size section of the massive multi-user car hire lot and told to choose our car from a selection of 6/8 pristine models. Finding out how to operate the hand brake, boot, headlights etc with the time rapidly approaching midnight on day 2 of our holiday and only a starling and distant raptor seen at Chicago airport, was testing but we eventually chose a Chevrolet Impala, because of its massive boot size (three large cases, two scopes and tripods, masses of camera equipment, hand luggage and overcoats no problem at all) and drove away, a little hesitantly, into the night. The car was exceptionally comfortable, as we had expected from a full sized model, and served us well for the 3106 miles we covered in 20 days. Returning the car was just as simple at the end of our stay. Not wanting to struggle on our first night in Houston we pre-booked a hotel room near George Bush Intercontinental – good call! As we were held over in Chicago we forfeited our room and in any event, even at 22.30hrs the following night, we had no problem obtaining a room at one of the numerous airport hotels. The ABA Birder's Guide to the Rio Grande Valley recommends booking rooms in advance in that area, even in winter. Accordingly we booked the Renaissance Casa de Palmas hotel in McAllen following on from a recommendation in Birdwatch Magazine Issue 150 December 2004 (the article on the Rio Grande Valley on Pgs 37-40 is quite helpful). Again we needn't have bothered; McAllen is a large city with many hotels and no shortage of rooms in January. We also booked three nights at Neal's Lodges Concan, as this is really out in the wilderness. I think we were the only guests, apart from family and staff. Uvalde, around 24 miles from Concan has both Holiday Inn Express and Best Western on I 90 to San Antonio. Where we really should have booked, to cover the journey from McAllen to Laredo, we didn't, and needless to say we arrived in Zapata (90 miles from McAllen) at 16.00hrs and couldn't get a room for the night. We trekked onward to Laredo (another 48 miles) and were easily accommodated despite our worst fears. We did however have to return via Zapata the following day to revisit the San Ygnacio/Falcon State Park area as we had not done it full justice the previous day. Anyone retracing our steps and wishing to stay overnight in Zapata would be well advised to book ahead. Try Best Western Inn by the Lake (956)765-8403 Fax (956)765-8071 or Falcon Executive Inn (956)765-6982 Fax (956)765-6610. With the exception of the Best Western in Winnie we were comfortable in all our accommodations. We should have paid more attention to the Birdwatching Trip Report from Birdtours from April 2004 by Simon Hartill who used the Studio 6 Motel which he describes as a cut above the Best Western. He goes on to say “lots of birders transferred from the B.Western to the Studio 6 after their rooms were flooded due to bad plumbing”. We commented to the staff that our room smelled damp and musty to be advised that it was a result of the humidity in the area! I wouldn't like to be around when the “humidity” next hits the fan. All hotels quote their prices pre State and local taxes so don't be surprised by your eventual bill. Our hotel bills for 21 nights came to $1971 at an average of $94 per night including all taxes ($78 per night pre taxes with prices ranging from $47 to $109). We did spend 6 nights at the Casa de Palmas which was one of the dearest at $109, but was also the most comfortable hotel we stayed in. The Holiday Inn Express chain is good value for money at around $70 per night; they usually have coin-operated laundry facilities – a must for 3 weeks travel. Most hotel rooms have irons, ironing boards, fridges and sometimes microwaves. All hotels included some form of continental breakfast in their prices. Again, Holiday Inn Express was probably the best value. Fast food chains abound if you like that kind of thing, although it can be a little much for 3 weeks. We did struggle to get fresh veg and what we normally consider a good meal almost throughout our trip. Some of the better venues were: Skip's Outrageous Bar & Grill and Al T's in Winnie: Outrigger Grill, Crystal Beach: Charlotte Plummer's, Rockport: New Wave Grand Buffet (Chinese) South 10th Street, Johnny Carino's (Italian) 601 South Jackson Road, Pharr, Olive Garden Restaurant (Italian) 222 West Highway 83, all in McAllen area: Tony's Restaurant and Hinze's just off Interstate 10 in Sealy. Food, drinks, fuel, various Park/entrance fees and all our other incidental expenses came to a grand total of $1797. Whilst the rest of the USA had much rain, floods, snow and ice, we were very lucky apart from two overcast days and one rainy afternoon. Temperatures ranged from 60-70+ °F and we never wore the waterproofs which remained snug in our cases. Numerous Trip Reports are available on the internet and there is also a proliferation of Texas birding sites, although not all are regularly maintained. A good place to start is the Fatbirder site, with lots of general and site information, plus links to Trip Reports etc. We didn't use any Bird Alert services, but these are also available once in the US. All can be obtained in the UK or via the internet and are available from the larger reserves in Texas. The ABA Guides are essential and contain all the maps and directions to all relevant sites on the Texas Coast and Rio Grande Valley. Most of the site information is up to date but if our experience is anything to go by, some of the bird distribution information is now dated with Mexican species coming across the border both more frequently and in greater numbers, plus a wider variety of North American species over-wintering, especially in the Rio Grande Valley. One site where information is out of date is Falcon Dam in the Rio Grande Valley. Since 9/11 the area below Falcon Dam (pg 80-82) has been closed to public access for security purposes. Whilst in this area through to Laredo we encountered and were stopped by Border Patrol on a number of occasions – make sure you have Passports etc readily available! The choice of Field Guides is really down to personal preference. We mainly used the compact Sibley Eastern North America guide, having left the larger Sibley North American Bird Guide at home. Some of the vagrants encountered are not included in the smaller version and, with more illustrative plates for most species, the larger guide is the best, if carriage is not a problem. Although we took the National Geographic and Peterson Guides with us, by and large they remained in the car and were hardly used. With the comprehensive maps available in the Birder's Guides, only a rudimentary road map is required to give the overall geography of the area. 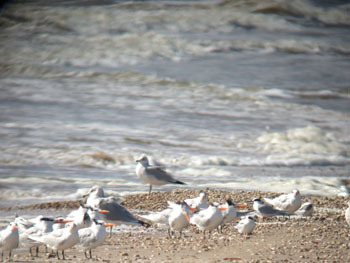 In addition 3 maps can be obtained for the relevant sections of The Great Texas Coastal Birding Trail for Upper, Central and Lower Texas Coast. These maps complement the Birding Trail's many signposts which we passed en route and also provide site details and directions for all of the Trail's numbered sites. 5/1/2005 Depart Manchester 10.50hrs arriving at Chicago O'Hare International Airport at c14.00hrs. As a result of snow and flight cancellations (see above) overnight Chicago Crown Plaza Airport Hotel. 6/1/2005 Depart Chicago 19.30hrs arriving Houston George Bush Intercontinental Airport at c22.00hrs. Overnight Holiday Inn Houston Airport. 7/1/2005 Travel from Houston to Winnie. 3 Nights at Best Western Hotel with visits to Anahuac, High Island, Boy Scout Woods, Crystal Beach, Rollover Pass, Bolivar Flats and Bolivar Peninsula. 10/1/2005 Travel from Winnie to Rockport/Fulton via Galveston Ferry, Galveston Island and San Luis Pass. 3 nights at Holiday Inn Express, Rockport with visits to Texas City Dyke on the way plus Goose Island State Park and Aransas National Wildlife Refuge (including boat trip from Rockport). 13/1/2005 Travel from Rockport to McAllen via Aransas Pass, Port Aransas ferry, Hans Suter Wildlife Park, Highway 77 and Sarita. 6 nights at Marriott Renaissance Casa de Palmas Hotel McAllen with visits to Santa Ana National Wildlife Refuge, McAllen Sewer Ponds, Frontera Audubon Thicket Weslaco, Sabal Palm Grove Audubon Centre, Bentsen-Rio Grande Valley State Park, La Joya, Chihuahua Woods Preserve, Brownsville City Dump, Los Ebanos Preserve and Laguna Atascosa National Wildlife Refuge. 19/1/2005 Travel from McAllen to Laredo via Salineno and Falcon State Park. 2 nights at Holiday Inn Laredo, revisiting the previous two sites plus Chapeno and San Ygnacio. 21/1/2005 Travel from Laredo to Concan via Las Palmas Trail in Laredo. 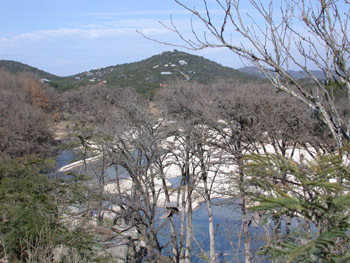 3 nights at Neal's Lodges with visits to Lost Maples State Natural Area and Park Chalk Bluff. 24/1/2005 Travel from Concan to Sealy. 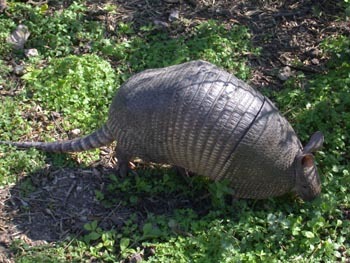 2 nights at Holiday Inn Express Sealy with visits to Attwater Prairie Chicken National Wildlife Refuge and Katy area. 26/1/2005 Travel from Sealy to George Bush Intercontinental Airport Houston for flight to Chicago departing 13.53hrs, with onward flight at 18.35hrs to Manchester, arriving on time at 8.05hrs on 27/1/2005. On the Interstates, Picnic Stops are just that. The only facilities are at the more infrequent Rest Stops. Fast food places abound near civilisation but otherwise are far and few between. Snacks available at all sites are very basic – biscuits, nuts and chocolate bars and a very limited selection at that! Excellent directions to nearly all the sites, including many maps, are contained in the ABA Guides. I have only included directions not otherwise available. The order of the sites reflects our itinerary. A delightful reserve which you can drive around and with a good visitor centre. Large flocks of Snow Geese and wintering waterfowl. We saw our only Merlin and Swamp Sparrow of the trip here plus a stunning Vermilion Flycatcher, a long way north of its usual range. Two visits yielded 63 species and a few alligators. Not really worth a visit at this time of the year (15 species) and hence we did not visit any of the other High Island woods. There was a flask and some plastic beakers on a table but we did not sample how fresh the brew was. The ladies rest-room was spotless – so Amanda tells me! Good for waders and gulls. We saw Black Skimmers and American Avocets for the first time at Rollover Pass. 50 species in two visits. A pleasant walk along the beach plus a trip through grassy flat dunes to an elevated viewing platform – we didn't see any snakes despite the warning signs. Highlights were c10 Piping Plovers and one Snowy Plover (until I found out that in the States Snowy is the same as Kentish). There were also numerous White and Brown Pelicans and a flock of 200+ American Avocets plus many gulls and terns. 27 species only in 2 hours. Brief visits to each whilst travelling from High Island to Rockport. Texas City Dyke and surrounding area is good for ducks and gulls. We saw our first Common Loon (Great Northern Diver) here and had good close ups of Least Sandpipers and Semipalmated Plovers. A lone Black-crowned Night-heron sat among the Pelicans on the pilings at the side of small fishing boats was unusual. 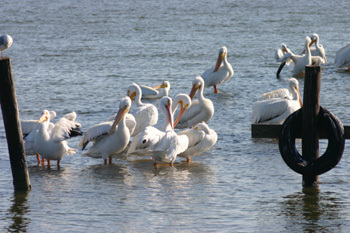 However, stretching 5 miles out into Galveston Bay, there is a lot of water with not many birds (28 species in total). Travelling down Galveston Island we came across our first Sandhill Cranes with a flock of c100, plus more snow geese and our first White-tailed Hawk. Overall we saw 59 species. Whilst herons, egrets, gulls and terns were plentiful, we saw c200 Lesser Scaup with a sprinkling of Buffleheads, Redheads and Canvasbacks all giving close views near the shoreline. We also had excellent close-ups of Wilson's Snipe, Western and Least Sandpipers, Greater and Lesser Yellowlegs all feeding along the shoreline about 20 feet from us. We saw our first Eastern Bluebirds and Least Grebes travelling along the coast to Fulton. A boat trip around the bay on board the Skimmer ($35 per person) gave us further excellent views of most species with around 20 Whooping Cranes, a few Caspian Terns and several Crested Caracaras. There are numerous Birding Boat Tours around the bay from mid-November to mid-April, with most trips lasting c3hrs and running mainly in the mornings. Reservations are suggested and full details of current locations, times, prices and phone numbers are available on request. 71 species in total over 2/3 visits. A small park with numerous RV's where the residents are keen to feed the local bird population. There appears to be a resident flock of c30 Black-bellied Whistling-ducks together with the usual array of ducks, herons, egrets, gulls and terns. We had further close-ups of most of the commoner waders and saw our first Hermit Thrush and only Grey Catbird of the trip. We also had our first good views of Lincoln's and Chipping Sparrows. 69 species in total over two visits. We had very distant views of the reserve's 3 Whooping Cranes from the substantial observation tower, along with our first views of Ladder-backed Woodpecker and Orange-crowned Warbler and our only sighting of Le Conte's Sparrow. The roads are all paved and there is ample space to park along the way. 52 species in total plus white-tailed deer and alligator. 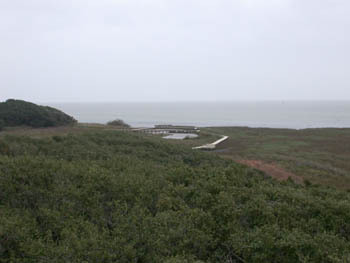 This site, on the opposite side of the Rockport peninsula to Aransas Bay, was recommended by Capt. Tommy Moore of the Skimmer as being one of the best in the area at the moment for good close-up views of over-wintering ducks and waders. Suffice it to say there was a very cool, stiff breeze, we didn't see any new species (29 in total) and we did most of our birding from the comfort of the car. A small gem of a site just off the Port Aransas ferry. We were on a pretty tight schedule travelling from Rockport to McAllen and only lingered for a few minutes. We had excellent views of our first Great Kiskadee, quite a way north of its usual haunts and also good close-ups of Least Grebes and Black-crowned Night-herons. We only saw 9 species, but on migration, feel this site has much potential. Only 15 species was a little disappointing after the site's advance publicity. The tide was however out and there were numerous waders in the distance once we reached the end of a small boardwalk. We had one of only two sightings of Blue-headed Vireo here. Numerous raptors all the way as the books predict; mainly Turkey Vulture, Red-tailed Hawk and Harris's Hawk plus a sizeable flock of Brewer's Blackbirds at Sarita. There are not many convenient stopping places along the route and where you do find them, they never coincide with the “interesting raptor overhead that you have never seen before, but was still only a Red-tailed Hawk in one of its many disguises (sorry….  plumages)". We did see 12 species en route, including our first Green Jays for the trip. This was our first real introduction to Valley birding with 10 lifers for the day, which included Plain Chachalaca, Green Kingfisher, Golden-fronted Woodpecker, Couch's Kingbird, Black-crested Titmouse, Long-billed Thrasher, Black & White Warbler and Altamira Oriole. The shortest trails immediately around the visitor centre were by far the most productive. Unfortunately, mosquitoes got the better of us as we walked around one of the longer trails and with very little going on, we wasted over an hour's birding opportunities. Similarly, we went on the tram ride around the reserve in the afternoon, but this is only worthwhile if you are interested in the history of the reserve and the general habitat, flora and fauna. There were no birding stops on the way but you do get to see the whole of the reserve rather than just the more immediate trails. Always attractive….wherever we go be it New Zealand, Gambia or Goa, I seem destined to take Amanda to the most romantic places (Brownsville City Dump to follow!) 27 species in all, with half a dozen each of Couch's Kingbird and Vermilion Flycatcher, our first Curve-billed Thrasher and the only 2 Nashville Warblers of the trip. A good compact site with a variety of habitats. 41 species, but what an amazing variety of excellent birds for such a small, essentially urban site. 2 visits, 4 days apart gave us our first Solitary Sandpiper, Common Ground-dove, Buff-bellied Hummingbird, White-eyed Vireo, Summer Tanager, Wilson's Warbler, Black-throated Green Warbler, Crimson-collared Grosbeak, Black-headed Grosbeak and Red-crowned Parrot, none of which were common, being seen in the main at only one of the other sites visited. In addition we had our only sightings of Ovenbird, White-throated Robin, Elegant Trogon, Common Pauraque, Grey Hawk and House Wren. The "goodies" did not end there with Clay-coloured Robin, Black & White Warbler, Olive Sparrow, Blue-headed Vireo and Ringed Kingfisher joining the impressive site list. The site is set back from the road at 1101 South Texas Avenue (FM88) in Weslaco. 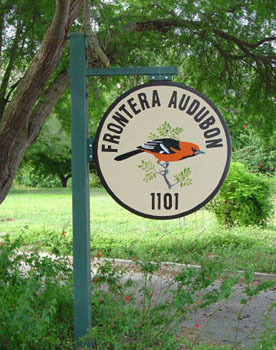 If you are planning a visit, check out the web site at http://www.fronteraaudubon.org/. Site pictures and photos of the Elegant Trogon and both male & female Crimson-collared Grosbeaks are reproduced with kind permission from Selena King, Executive Director of the Frontera Audubon Organisation. Only 19 species, all seen elsewhere, with neither target birds, Chihuahuan Raven or Tamaulipas Crow. Why bother! Seriously, the Crows have not been seen here for a few years and there's no way I would visit the site again just to see thousands of starlings, gulls and grackles. Not much by way of a Visitor Centre or amenities but the site itself was host to some excellent birds. We had our only sightings of Yellow-crowned Night Heron, Sora and Northern Waterthrush, plus our first sighting for the trip of Clay-coloured Robin. In addition we had good views of Ringed Kingfisher, Black-throated Green Warbler and Wilson's Warbler. Only 36 species, but some excellent birds. This was the worst site for Mosquitoes – April must be miles worse! Due to the disruption to the natural habitat, you can no longer drive the paved roads here. Also RV's appear to have been banned and this large Park had something of a deserted and unloved feel about it. The Visitor centre and facilities were however, probably the best we encountered. Regular trams take walkers and birders into the Park but you are likely to see more by walking in on foot. We had our first Greater Roadrunner and Olive Sparrow here plus our only sightings of Indigo Bunting, Northern Rough-winged Swallow and Cave Swallow. We saw 42 Species in all, including a photogenic Ringed Kingfisher by the Park entry, where we also saw our first wandering Coyote. A bit disappointing and not the feast of sparrows and desert species the books lead you to believe. We did possibly catch the area on an off day and it was around 13.00-15.00hrs. We managed only 9 species, but did see our first Verdin on the edge of the “woods” – an area mainly consisting of thorn scrub and cactus. It appears no visit to the McAllen area is complete without taking in the garden of the Williams family at 750 West Sam Houston Avenue in Pharr. The 2 acre back garden has been replanted with native bush and oaks, replacing alien vegetation, and is liberally sprinkled with water features and feeding stations. Birdquest winter tours of the Rio Grande Valley appear to stop off here and the previously mentioned Birdwatch article also features this “developing oasis of prime habitat”. This location is found by exiting the US 83 Expressway at the Jackson Road exit in east McAllen and following Jackson Road east until it changes name to W. Sam Houston Avenue in Pharr. 750 is on the north side of the street between the Senior Friends Nursing Home and the Skinner-Silva Funeral Home. There is a parking area outside the front fence and an entrance fee of $5 each. The garden has been host, on and off, for quite a long period to a Blue Mockingbird as well as an increasing number of other passing rarities. Unfortunately, even though it was being sighted sporadically, we missed the Mockingbird on our two visits, first thing in the morning and last thing at night. We did however see our only Rose-throated Becard here as well as our first Cooper's Hawk. We also saw a roosting flock of c30 Red-crowned Parrots, female Crimson-collared Grosbeak, Summer Tanager and Olive Sparrow. Only 22 species, but some quality! Not a site per se but a very small, walled private garden almost in central McAllen where we went to see a Green-breasted Mango that had almost taken up residence at the owner's Hummingbird feeders. Here we also saw our only American Redstart of the trip. Well worth the $10 each entrance fee to be donated to the owner's favourite charity as we were continually buzzed by a Buff-breasted Hummingbird whilst waiting for the Mango to appear. A charming compact 82 acre private reserve which has a historic colonial style ranch home and gift shop and is located on State Highway 100 between Harlingen and Brownsville. From Expressway 77/83, take the South Padre Island exit and go east 100 yards to the entrance on the left. We went to Los Ebanos to find our only Golden-crowned Warbler of the trip and also picked up our first Hooded Oriole and a superb Black-throated Green Warbler. 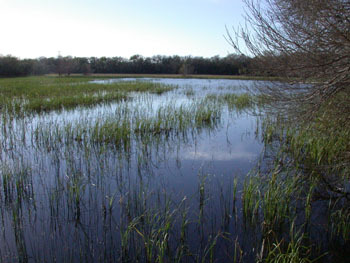 The preserve has a small Resaca (lake) and a good selection of varied habitats including some of the original brush of this area. We stayed for a little over an hour as we were on our way to Laguna Atascosa, but we still managed 27 species. 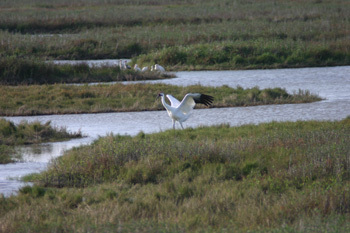 The reserve is open for birding during the winter and all year for special events. For information ring (956)399-3543 or (956)399-9097 or go to www.losebanospreserve.com. 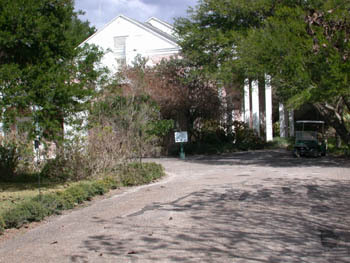 The preserve is operated by Taylor Blanton and his wife Martha Russell, a descendant of the original owners. We met Taylor as we arrived and he gave us comprehensive directions to the Golden-crowned Warbler's preferred habitat. He is a very friendly individual, hoping to make this new preserve increasingly attractive to all, especially birds, butterflies and birders. Excellent for waders, ducks, gulls and terns as you would expect from a coastal site. We saw our only Grasshopper Sparrow here and had a fleeting glimpse of two hunting Aplomado Falcons whilst we scanned the shallow pools and marshes. As we arrived we saw a Nine-banded Armadillo and a Long-tailed Weasel by the Visitor Centre and as we were leaving 5 Coyotes crossed the road immediately in front of us. As you would expect with a 45,000 acre reserve, there were long stretches of the 15 mile paved drive around the various habitats where few birds were seen. 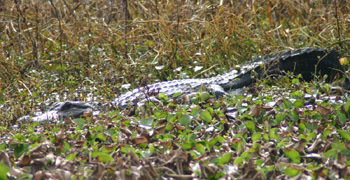 However we had 63 species in 4 hrs plus a few obliging alligators. There is only one road going southwest off US 83 at the Salineno turnoff. Follow the road through the various settlements and town square until you reach the Rio Grande, where there is a small unpaved parking lot. The woodland along the river is quite productive, as is the river itself. But if you want armchair birding at its best, walk back about 50 yards to the set of wooded lots on your right (with your back to the river) to what is referred to as the Salineno Birding Colony in the Birder's Guide to the Rio Grande Valley. The passage of time has seen numbers dwindle so much that there is now only one elderly couple and their RV on the site over winter. The De Windts maintain a substantial feeding station that attracts birds from miles around and with numerous daily visitors, they provide seating for about 20 on old garden chairs. In two visits to the area of about 1 hr each we saw 59 species, including our first sightings of Cactus Wren, Bewick's Wren and Audubon's Oriole. We also had our only sightings of the trip of White-winged Dove, Eastern Screech Owl (in a nesting box), and Brown Jay, together with excellent close up views of Hooded Oriole, Green Kingfisher, Olive Sparrow, Chipping Sparrow, Clay-coloured Robin, and Common Ground-dove with distant Bufflehead on the river. A Cotton Rat was also attracted to the seeds under the feeders. Chapeno, although only a little further up the valley from Salineno, wasn't as productive: we went down to the public access to the river but as we were closely followed by a Border Patrol Guard we didn't outstay our welcome, and having already seen several Brown Jays, we didn't bother with the RV Park, which looked extremely quiet. The river was devoid of birds and although we must have seen Northern Mockingbirds and one or two Grackles etc., we didn't bother with any site records. The Park was quiet although there were a few isolated bunches of RVs. All the roads are paved and access is good throughout. We saw 55 species across two visits, including our only trip sightings of Anhinga and Scaled Quail and our first sightings of Northern Bobwhite, Pyrrhuloxia, Cedar Waxwing, Say's Phoebe, White-crowned Sparrow, and Black-throated Sparrow. Cactus Wren, Vermilion Flycatcher, Verdin and Summer Tanager were also noteworthy. 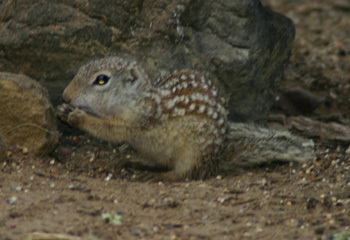 We also saw a Mexican Ground Squirrel feeding alongside the sparrows. Small privately maintained river-side site well known for its White-collared Seed-eater flock. We made two brief visits but only had a fleeting glimpse of one of the birds before it flew off into the scrub. We had our only sightings of Lesser Goldfinch here with a flock of c12 birds bathing and drinking from a dripping tap in the main viewing area. We also saw our second Black-headed Grosbeak and as we were leaving our only Chihuahuan Raven of the trip flew overhead. 23 birds in all with quality rather than quantity being the theme. We later found out we missed a Blue Bunting here. We also missed a Blue Bunting here (habit) although on this occasion we knew it had been there and we were specifically looking out for it. We stayed here for about an hour and only saw 4 species, but we did have unbelievable close-ups of a pair of White-collared Seed-eaters. Not a site I would rush to revisit, but anyone wanting WCSE might! 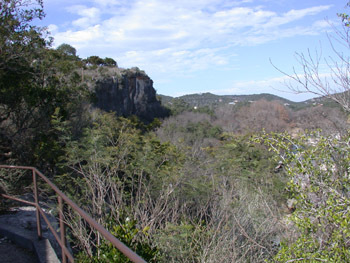 The Trail is located near the Zacate Creek. Take IH35 South to International Bridge No. 2 exit. Go left on Matamoros Street (look for huge American flag) and right on San Leonardo Street (about 4/5 turning). Go all way to end of San Leonardo to Water Street and turn right. Follow Water Street to end and park. At the time of our visit there was some construction going on here with the Trailhead unmarked and to the left of the construction. Less than 100 yards back up Water Street we found another more convenient entrance to the Trail, leaving not as far to walk back along the river bank. By walking left (away from the International Bridge) along the Trail for 2/300 yards you reach an area that opens out into suitable habitat, away from the river towards the nearby housing. 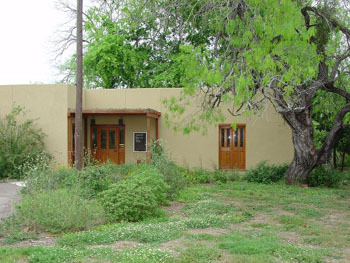 Away from the flat boring coastal plain, Concan is on the Edwards Plateau and has been home to Neal's Lodges since 1926. This attractive vacation spot has 61 cabins set in 300 acre grounds and has a grocery store open all year round as well as a seasonal café. Most of the cabins are rustic in appearance but have heating and air conditioning. Whilst the fixtures and fittings of our cabin were a little tired, it was scrupulously clean, very spacious and had superb views. Look for yourself at www.nealslodges.com. We were in contact with Mary Anna Roosa (Manager/Owner) by email prior to leaving the UK and she was extremely helpful. 4/5 days prior to our visit June (RIP 15/8/07) and Harold Osborne were staying at the Lodges. 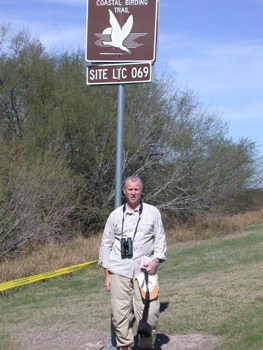 June wrote “A Birder's Guide to Concan, Texas (and surrounding area)” which gives comprehensive guidance to all the local sites and she was described as “Resident Birder” for Neal's every April. June was kind enough to leave us a comprehensive handwritten list of birds she had seen, together with site details. We managed to see nearly everything on the list and a few more besides. We saw our first Common Raven, House Finch, Field Sparrow and Rufous Crowned Sparrow and only Canyon Towhees of the trip. In addition we also had Eastern Bluebird, hundreds of Cedar Waxwing, Verdin, White-eyed Vireo, Pyrrhuloxia, White-crowned Sparrow and Black-throated Sparrow, together with a friendly Nine-banded Armadillo. 45 species in all in the Lodges' grounds. This site was very disappointing. Granted it was too early for its specialities, Black-capped Vireo and Golden-cheeked Warbler. We did however have our only Western Scrub Jays of the trip and our first Carolina Chickadee. 15 species in all. One of June Osborne's own sites, along SH 127 from Concan to Sabinal, turning left onto FM 30 and looping into Uvalde County Road 329 back to SH 127 just before reaching Sabinal. We saw 25 species, over a relatively short drive of under an hour, including Brewer's Blackbird, c500 Black-bellied Whistling-duck, 20 Northern Bobwhite and Say's Phoebe. We also had 11 Sandhill Cranes flying over and saw c10 White-tailed Deer in a roadside thicket. Not a good site to go to if you wish to see the endangered Prairie Chicken! The species appear to be struggling here and whilst all the females and a lot of the males are electronically tagged, they tend to remain in an area which is off limits to the public except for 2 days each year, usually in the second week in April unless coinciding with Easter. Attwater's 2005 Prairie Chicken Festival takes place on April 9-10 when early morning tours are organised to see the birds on their booming grounds or leks. Throughout the year you are only allowed to drive around a small part of the reserve (about 10%), with very few stopping places on a narrow unmade road. Thankfully we saw few other birders whilst there and were able to stop on the track and enjoy the birds on the ponds and marshes. We saw 69 species in and around the Reserve on three separate visits, including our only Song Sparrow, Ross's Goose (at long last after scanning thousands of Snow Geese both here and at Anahuac), Richardson's Canada Goose, Bald Eagle, Masked Duck and Cinnamon Teals of the trip together with Vesper Sparrow, Say's Phoebe, Vermilion Flycatcher, Red-shouldered Hawk and Sandhill Crane to name but a few. We saw White-tailed Deer around the Pipit Trail and several large Nutria (Coypu) plus their young in the water. These natives of South America seem to flourish here after their introduction. We drove around the whole area outlined in the ABA Guide and managed to see 40 species, but nothing new. We did see White-tailed Hawk and flocks of c 5000 Snow Geese flying in the distance, but overall a little disappointing - perhaps the wrong time of the year. We saw 220 species with 129 lifers in our three week trip. 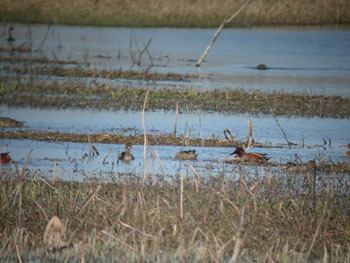 Texas is a wonderful Birdwatching location, even in January. We enjoyed some special birds, especially in the Rio Grande Valley and will definitely be going back in the near future, but probably in April for the spring migration spectacle. The total cost of our holiday was in the region of £3,450 for 3 weeks. We could have economised in a number of areas and no doubt reduced this figure by several hundred £ but in this instance, cost was not an issue.